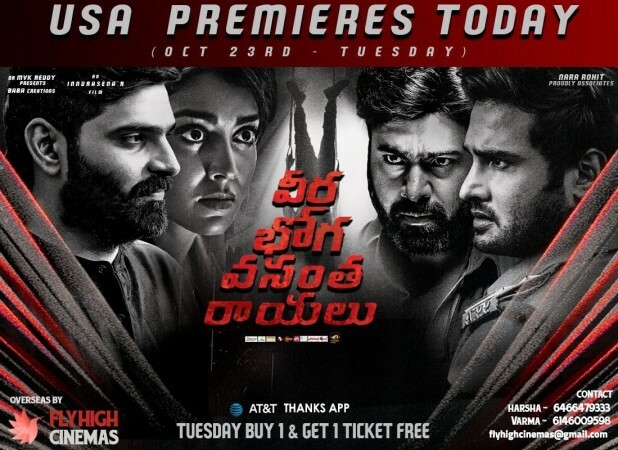 Veera Bhoga Vasantha Rayalu review live updates: Director R Indrasena's Telugu movie VBVR is a mystery film crime-thriller starring Sree Vishnu, Sudheer Babu, Nara Rohit and Shriya Saran. Director R Indrasena's Telugu movie Veera Bhoga Vasantha Rayalu (VBVR) starring Sree Vishnu, Sudheer Babu, Nara Rohit and Shriya Saran, has garnered mixed reviews from the audience in the US. Veera Bhoga Vasantha Rayalu is a mystery film crime-thriller that has been written by director R Indrasena. Apparao Bellana has bankrolled the movie under his banner Baba Creations. The movie has received a U/A certificate from the censor board and its runtime is 2.19 minutes. Veera Bhoga Vasantha Rayalu story: The movie deals with three subplots, a hijacker who is behind the disappearance of a flight carrying celebrities, child trafficking and a missing house. How are all these three stories combined? Answers to this question form the crux of the movie. Analysis: Indrasena has picked up an interesting subject, which has never been brought on screen by Tollywood, but he has failed to execute it. The movie suffers from a slow-paced narration that will test your patience, say the audience. Performances: Sree Vishnu, Sudheer Babu, Nara Rohit and Shriya Saran have delivered wonderful acting, which are the saving graces of Veera Bhoga Vasantha Rayalu. Srinivasa Reddy, Manoj Nandam, Charith Manas, Shashank, Ravi Prakash and others have also done justice to their roles, say the viewers. Veera Bhoga Vasantha Rayalu (VBVR) movie review: We bring you some viewers' reactions on the film shared on Twitter. Continue to see audience response. Just watched #VBVR in Nashville USA. Great movie from Indrasena R. Kudos to entire crew. Nice suspense thriller. Climax is ultimate..no one attempted till nv in Telugu #VeeraBhogaVasanthaRayalu #CultisRising #NaraRohit @shriya1109 @isudheerbabu @Inndrasenar #BabaCreations #VBVR Real #cult from Indra and movie is above everyone's imaginations here. Climax is ultimate...no one attempted this in Telugu. Just watched #VBVR Premier. Kudos to Dir #Indrasena. Loved the screenplay. Congo to @isudheerbabu @nara_rohith @shriya1109. Special mention to @sreevishnuoffl bro for the character he portrayed & encouraging new age movies & directors. #VeeraBhogaVasanthaRayalu - The mabbest cinema ever. Having that such a good star cast, director would have created wonders, instead he made a nonsense film. #VeeraBhogaVasanthaRayalu is an expample how a story may be very exciting on paper vs not even close to good on screen if not handled well. Most unrealistic, illogical, confused execution of good plot. Basic idea and last 15 mins are ok but apart from that, #VeeraBhogaVasanthaRayalu is utter crap. Can give tough competition to #Officer and #AtNartanasala to become to worst movie of the year #CULTisRISING ‍♂️‍♂️ Skip It..